I’d like to thank everyone who came out to participate in and/or support this year’s Running Up For Air – Grandeur Peak Challenge, it was a real testament to the strength of community, human will power, and the importance of setting lofty goals. This day was focused on outdoor enthusiasts challenging themselves to sumitting Grandeur Peak as many times as possible, however, let’s not forget the motivation behind the event, which was to bring awareness to the fight for better air quality and raising critical funding for Salt Lake City’s incredible non-profit group, Breathe Utah. If you haven’t donated yet, please do so now! Wow, what an incredible day we were blessed with! The morning twilight was magical for those who started early. After an amazing sunrise it was bright and sunny with folks in t-shirts and shorts for most of the day. As the sun began to dip behind the Oquirrh mountains at sunset we got to watch the city come alive as lights below quickly turned on. As the temps dropped and the wind picked up, the upper portion of the trail quickly turned icy requiring careful navigation. The moon, lightly veiled by high elevation clouds, kept me company for my final few laps making for a surreal and beautiful experience. I paused on the summit after lap 12 and replayed the day in my mind. So many incredible and inspiring people I had shared footsteps, smiles, and encouraging words with on this special day. For those who were out all day you got to witness first-hand how rapidly the valley can fill up with haze as seen in the image below. If I’ve missed your name, please let me know! This event embodies several of the key ingredients required for us to dramatically improve the air pollution that often plagues us during winter temperature inversions : community, will power, lofty goals. However, this is far from the complete package. Paramount to us solving this is also education and a community-level prioritization. I am extremely happy to say that I plan to be teaming up with Breathe Utah and Utah Clean Energy to offer a series of free and open to the public seminars on “net-positive living”. This is in reference to how we as average citizens can easily create all the energy we use, at our own homes, declare our energy independence, and play some role in cleaning up the air. In the past 2 years my wife and I took our 1942 home in Highland Park and turned it into a highly energy efficient home that harvests all of the energy we use for heat home, hot water, power for all lights/appliances, and fuel an electric car and motorcycle. We are so excited about how well it has worked out and can’t wait to share what we’ve learned with others. We’re saving an enormous amount of money in the process as we no longer have natural gas, electricity or gasoline bills (at least for one car). We have officially gotten ourselves off the “lifetime utility payment plan”. Keep an eye out on my blog for details as the dates & times are established. Barkleys report coming soon I sure hope! Having recently moved out of Logan, I can appreciate the inversion air you are dealing with. Glad to see someone trying to make a difference. My battle-ready leggins were just modified tights, cutoff at the upper thigh, that were modified to have some abrasion resistant patches on shins and quad area. My buddy John McGuire made them for me. Sadly, with the extremely warm conditions in 2012, I only wore them for one or two descents, they were simply too hot. I’d recommend calf socks. Jared- I’ve been living on the east coast for 2 years, so have done my share of bushwacking. I’m sure nothing as crazy as Barkley, but we’ll find out. Thanks for the advice on calf socks. Good luck to you. It’s good to see such community activism over this. 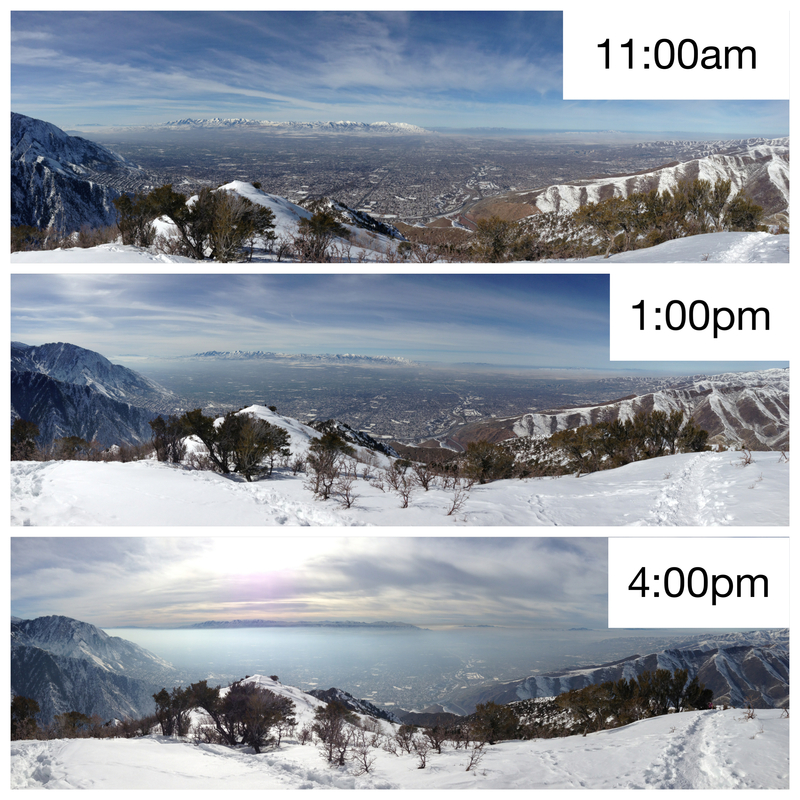 I happened to be in SLC this past weekend and it seems like I witnessed the inversion get progressively worse even over my short Thursday-Saturday trip. There is a lot of beauty in the valley and surrounding mountains, hopefully everyone will get out and do what’s necessary to clean things up for future generations of outdoor enthusiasts.